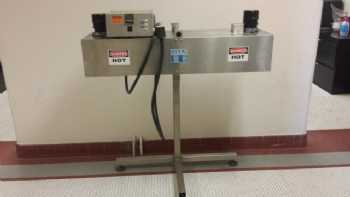 This type of shrink sleeve equipment heats air around a package that is wrapped in a shrink sleeve. The heat causes the shrink sleeve to fit tightly around the product. Heat tunnels are usually designed with a conveyor belt to carry the product through the tunnel. Each tunnel has adjustable temperature controls. A shrink sleeve heat tunnel is designed for use with shrink sleeve, neck bander or tamper evident applicators.